FORT WASHAKIE — The Shoshone people, like most indigenous cultures, traditionally passed on their language orally. Though Shoshone-speaking Native American tribes inhabit several western states, the number of fluent speakers has dwindled consistently over the past decades. Some experts estimate there may be less than a few hundred fluent speakers of the language alive today. A survey of fluency was conducted last year of Eastern Shoshone tribal members ages 50 to 100 years old. Out of a total of 844 people who fit these age categories, only 103 identified themselves as fluent and 106 were proficient or had limited understanding of the language. Every year these elders pass away, taking with them a wealth of knowledge about the language. In an effort to combat these decreasing numbers and preserve the Shoshone language, Eastern Shoshone tribal members on the Wind River Indian Reservation in Wyoming are combining technology with tradition to help save the language. Schools on the Wind River Indian Reservation have attempted to respond to the community desire to hear the language once again flowing from the mouths of their children. However, for a language that was never written, and as the number of fluent speakers dwindle, educators are in a race against time to create tools that teach and document the vast vocabulary for the next generation. 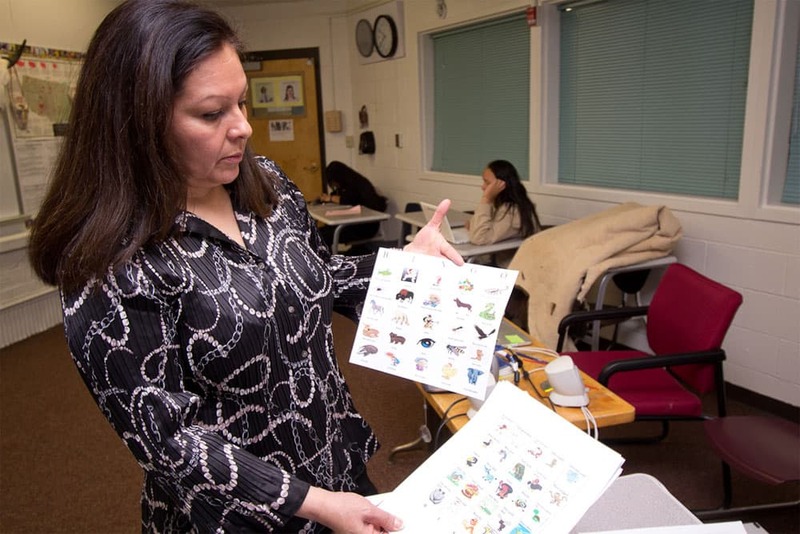 Ten years ago, Eastern Shoshone tribal member Reba Teran was using digital audio to record an audio dictionary to accompany the most complete phonetic dictionary ever compiled of the Shoshone language. Teran mixed audio with written words because she said Shoshone is a language that is hard to read if you never heard it. According to Teran, the language is complex because it is nasally and has a “trill like in Spanish.” There are also some words that have a silent long “E” and others flow with an accent on certain words, some longer, some shorter, or said faster. Others have taken on the challenge such as George Hill of Salt Lake City who created a 600-word dictionary printed in 1877; a 22-page Shoshone language dictionary written by trader J.K. Moore of Lander, Wyo., in the 1800’s; and smaller and more recent dictionaries of 300 or less words compiled by Wind River Indian Reservation residents Gladys Hill and Melinda Tidzump. All of these served as reference points and sources when Teran started researching for the audio dictionary. “I get a lot of people asking me when it’s going to be ready so they can see the words,” Teran said of tribal members from the Comanche tribe, a related dialect, and other bands of Shoshone people. In 2002, Teran and a team of three tribal elders including her older sister Beatrice Haukaas, Manfred Guina and Roberta Engavo recorded more than 14,000 words and phrases, transcribing 9,000 of them. But it was dream that never fully materialized. It’s a challenge that still weighs heavily on Teran’s mind. Early on, someone told her she would never finish the project. “I do want to see it get done … it’s such an important thing,” Teran said. “We had gotten through the alphabet; we got to the T’s. That’s how close we were to the end,” she said. In 2009, the Eastern Shoshone tribe planned to partner with the University of Wyoming’s American Indian Studies (AIS) program to create a lexical database of the Shoshone language after the AIS was awarded a $200,000 National Science Foundation grant. University of Wyoming linguistic anthropologist David Shaul planned to work with Teran and a panel of Shoshone elders to create the project. This would include the work already assembled by Teran and the three tribal elders. Also in the database would be the early written records of the Eastern Shoshone housed at the National Anthropological Archives of the Smithsonian Institute and the University of Wyoming’s American Heritage Center, in addition to the work of the late Professor Emeritus Anne Slater. “The database will provide the basis for the future development of additional Eastern Shoshone language and teaching materials,” said University of Wyoming American Indian Studies Director Judith Antell in a 2009 press release. But shortly after this partnership was announced, Teran, the Eastern Shoshone language coordinator, lost her job working for the Eastern Shoshone tribe. She also was no longer involved with the project. Shaul said the grant was written to include an intermediary that would serve between the university and the panel of elders, but since the tribe did not appoint Teran’s replacement, to date Shaul has not worked with any tribal elders. “Because I cannot officially work with a speaker, the database is archival; it contains all words and phrases from published and from major unpublished sources available to the public,” Shaul said, adding that similar databases only have 1,800 to 2,000 entries. Shaul has spent the past years curating written records and audio/visual objects for the database. The project wraps up in July and copies will be made available at the Fort Washakie School/Community library, the American Heritage Center at the University of Wyoming, the University of Wyoming library and any other tribal libraries or entities that want a copy. “The project contains over 4,000 main entries, making it by far the largest dictionary of a Shoshone variety, except for Comanche, which many people consider to be a closely related language,” Shaul said. Time and money, Teran recalled, were always major roadblocks. She paid elders $15.00 an hour to research and record words. She explained that in the Shoshone language there is often more than one way to say a word. For example, the word “squish” can be said five different ways ranging from squishing something with the tip of a sharp object, your hand, body, foot or by sitting. Speakers averaged documenting 270 words a day. In 2007, a $1,500 grant from the Wyoming Humanities Council only lasted a week. “It went pretty fast,” Teran said of the money. When Teran started the phonetic and audio dictionary project 10 years ago, she said she felt a sense of urgency because there were only a few Shoshone elders who were fluent speakers. Today, Teran estimates that number is even smaller as elders pass away. And for her, that sense of urgency has amplified. “The whole idea of using technology is to incorporate language and culture. It’s a very effective tool for me because of student engagement,” said middle and high school Shoshone language teacher Lynette St. Clair. She often has her students utilize laptops and programs like PowerPoint to aid students in speaking Shoshone. 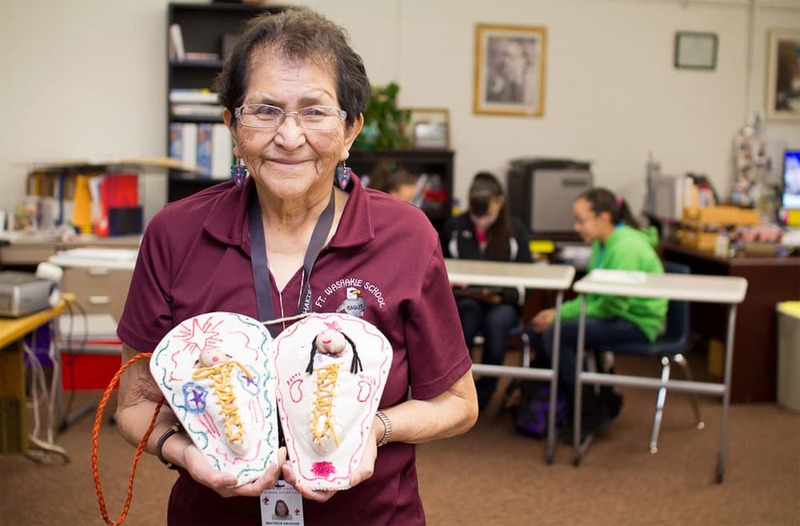 When St. Clair started to teach the language to high school and middle school students at Fort Washakie, she had one rule — there was no one right way to speak Shoshone. Before accepting her new role, St. Clair served as the Indian Education Coordinator at Fort Washakie School from 2007-11, but her contact with the language started at youth. St. Clair grew up communicating with her parents and grandparents in Shoshone. She said she was able to keep those speaking skills honed over the years with weekend conversations in Shoshone with her mother over coffee. Now St. Clair, along with longtime Shoshone language teacher Cathy Standingrock, who teaches the elementary students at Fort Washakie, is working to cultivate the language in the school and their community. “I am fortunate to have Beatrice (Haukaas), a master speaker, in my class,” St. Clair shared, referring to Teran’s older sister who was involved with the audio dictionary effort. This year, Haukaas works as a teacher’s aide in St. Clair’s classroom. 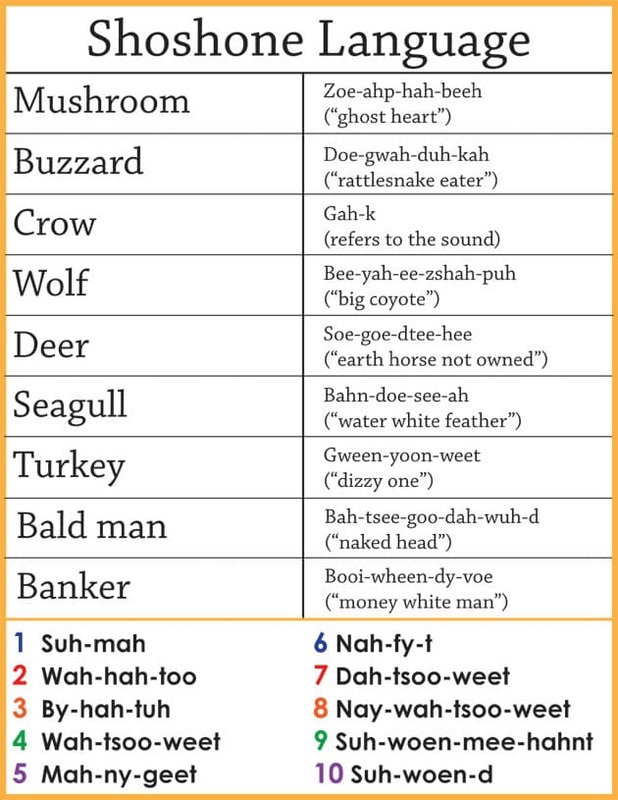 The two often incorporate the phonetic spellings used in the audio dictionary, which gives their students a consistent way to spell the language. All students have a copy of the language project, which are on CD’s, as a reference. Last year, St. Clair attended a conference on preserving Native languages. There St. Clair was introduced to the world of programming using an iPad. Within a day, St. Clair developed a short demo program to teach the Shoshone language using Thornton Media software. Her demo features categories and images, that when selected by the user, identifies the object in the Shoshone language. Not only can the user read the language, they can also hear it. The demo is not implemented in St. Clair’s curriculum yet, but she does allow students to play with the demo, and students are excited to have another outlet to learn the language because for some, becoming fluent is a goal. For eighth-grader Adrianna Goggles, the idea of a program that can teach Shoshone is convenient. Goggles often learns Shoshone words and phrases from her grandmother but said the majority of her knowledge is attained at school. She has downloaded the Shoshone audio dictionary to her iPod, adding that her aunt has it on her PS3 gaming system. An iPad and Shoshone language program she could utilize on the weekends or after school to learn would only benefit her more. “Instead of waiting for someone to teach you (Shoshone) you can pull (the iPad) out,” Goggles said of the potential of the software program. Cheyenne Hebah, a seventh-grader, wants to learn because she is worried about the future of the language. In March 2011, Thornton Media released its first-of-a-kind application for the iPad and iPhone that teaches users to write using the Cherokee alphabet. The app called Writing Cherokee also features recordings voiced by Cherokee language instructor Harry Oosawee, so people can see how words are written and pronounced. Creator Don Thornton founded Thornton Media in 1995 as a way for tribes and communities to revitalize their languages without the need for outside help so they could control their own cultural property. Thornton was inspired to create the company after his grandmother helped an Oklahoma university professor create a Cherokee-English dictionary but never received any credit or pay for her work. Since the company’s inception, Thornton has worked with over 100 native communities to save their languages. Thornton Media is currently trying to secure funding to create a full immersion 12 level video game with interactive characters designed to teach native languages. Characters in the game only speak in native languages and players can communicate back in the same language. Currently, only a demo version of the first level is available. Tools like this could be the next steps in helping Native American languages flourish among their tech-savvy youth. 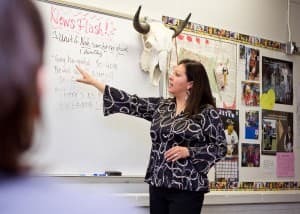 St. Clair is certainly optimistic about the possibilities and has applied for a three-year, $300,000 language preservation and maintenance grant through the Administration for Native Americans to secure funding to turn her demo into a full-fledged teaching tool for students. If fully developed, the program will allow students to learn to speak and write Shoshone using games, pictures and quizzes on iPads. When a student completes a speaking quiz the information will have the ability to be automatically emailed to the teacher. The program is also capable of including videos of elders making such things as cradleboards or allowing students to listen to tribal songs and read about historical sites on the reservation. “I’m confident that what little we’ve done so far can be a model for others,” St. Clair said of the potential of the program. St.Clair also integrates the progressive teaching methods of University of Montana Professor Stephen Greymorning called Accelerated Second Language Acquisition. His system eliminates the need for English by teaching students how to speak the language and not merely translate. The idea is to get students not only speaking in native languages, but thinking in it as well. Greymorning’s techniques do not use technology but do incorporate the knowledge of elders. St. Clair agrees, but believes the combination of the wisdom of elders mixed with technology can further help ensure the language thrives. — WyoFile contributor Tetona Dunlap is a writer and photographer for The Valley Journal in Ronan, Mont. She grew up on the Wind River Indian Reservation and recently completed the University of Montana’s journalism graduate program. How do you say ” run free” and ” breathe free” in Shoshone. The problem is that the kids don’t want to learn the language. It is too difficult and requires too much effort for them and they just don’t have it in them to put that much work into it! I wish I was wrong but after having worked with hundreds of Native kids I think I have a pretty good idea about this. The native kids of today are more interested in the Black culture than they are of their own culture. Their heroes are black basketball players or hip hop artists and most don’t even know their own tribal history. They have lost all respect for their elders and the Wind River Reservation has the lowest test scores in Wyoming. Nice dream but the Native languages will be all but dead within 100 years! We Shoshones have always gathered, but the gatherings were lost, but over the last 12 years, the Shoshonean speaking tribes have revived the gatherings, and one of the purposes is to help in preserving the language. Also knowledge and Wisdom are passed on at these gatherings, but we do need to begin finding ways to preserve our language using whatever means is necessary. Modern technology can help the oral tradtion. We plan to gather this year in Jackson Hole, Wyoming on July 18-22, 2012. If you want more information, please check out the Shoshonean Reunion.com website. Thanks for this story. Great article. Although Dr. Greymorning does use technology to teach as well. He actually had Walt Disney Studios rerelease the children’s classic, Bambi, in the Arapaho language so that children could learn their language that way. To learn more about language revitalization among Native Americans and to help fund our film on the topic go here: http://www.indiegogo.com/Lost-Words?a=381435.